Ford Motor Co. has been making great strides on quality measurements from Consumer Reports and J.D. Power and Associates, the two leading arbiters of automotive quality. 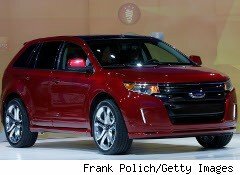 But CR said that the Dearborn, Mich., automaker stumbled with the redesign of its Ford Edge and Lincoln MKX crossovers, as well as the "MyTouch" electronic systems that are in both vehicles. CR said that it will not be recommending the vehicles, or the MyTouch system, which is also planned for other Ford vehicles.A driver can use those control systems to operate the sound system, climate controls and navigation system by means of either an 8-inch video touch screen in the center console or voice commands. Consumer Reports cited the MyTouch technology as the main drawback to the Edge and MKX. It said the technology is "a complicated distraction while driving. In addition, first-time users might find it impossible to comprehend. The system did not always perform as promised." CR also said it will not recommend the Chevrolet Tahoe SUV because the SUV tested too low when put thorough the magazine's paces. CR also said it will not recommend the Infiniti QX56; the V-8 version of the Jeep Grand Cherokee; and the Porsche Cayenne, but only because those SUVs were too new for Consumer Reports to have adequate reliability data to recommend, it said. CR pointed out that they tested well with the magazine's staff, but they have to wait for owner feedback before they can actually recommend them for purchase. The publication said it only recommends vehicles that have "performed well in its tests, have at least average predicted reliability based on Consumer Reports' Annual Auto Survey of its more than seven million print and Web subscribers, and performed at least adequately if crash-tested or included in a government rollover test." The full tests and rating for all the vehicles will appear in the February issue of the magazine, which goes on sale today. The reports also are available to subscribers of www.ConsumerReports.org.